Affordable and Adorable! 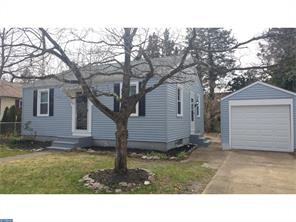 This Cherry Hill rancher is Move-in Ready and offers Loads of Updates! Located in the Kingsway Village neighborhood, this home is conveniently positioned near Kings Highway and Rt.70 and is around the block from the local playground. Offering a Brand New shingled Roof, New Siding, New Vinyl Windows, New storm doors and New Gutters & Downspouts along with a matching Detached Garage complete with New overhead door - this Home will offer Easy maintenance for the new Homeowner! Inside features an Inviting Living Room with Refinished original hardwood flooring and fresh paint throughout, Remodeled Eat-in Kitchen with New soft close cabinets, Granite Counters, recessed lighting and ceramic tiled floors! Updated Bathroom includes new sink, toilet, mirrored medicine cabinet, lighting, ceramic floors and tiled tub surround!